This gorgeous Grade II Listed building has a magical rustic quality and is a perfect spiritual base for doing the whole 'Shakespeare Thing'. For travellers of a Do-It-Yourself bent, self-catering can offer the flexibility and value-for-money that hotels and guest houses find difficult to provide at a reasonable expense. 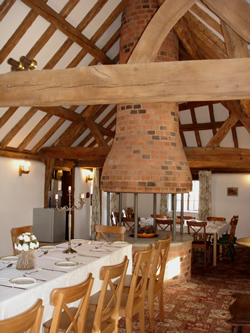 The upside is that lodging can often be as cheap or as costly as you like, depending on whether you fill up your larder at Waitrose or at the local Tesco Express (both are a just a seven minute drive down the A435 in Alcester town centre). Stratford-upon-Avon is just a 20 minute drive and Warwick Castle and The Cotswolds are also within easy reach. The cottage sleepts up to 22 people and is just a short walk from Coughton Court (owned and managed by the National Trust). The 10 bedrooms offered are all en suite and much of the original spirit of the building has been preserved wherever possible (exposed red-brick work, solid oak beam ceilings, cast-iron bed frames - the whole works). Five of the bedrooms have picture windows overlooking the water garden. All accommodation at The Lodge is on ground floor level making it ideal for different age groups. The kitchen and dining area is stunning and features a range cooker, 2 microwaves, 2 dishwashers, large fridge, large freezer, extensive storage space and broad work surfaces. Split the cost between several of you and you can 'do Shakespeare' rather cheaply and in style.